Mike's screaming skills were recognized long before the beginning of a Green Day era. So were his bass playing skills. This intro leads to his band position which is a bass player. So is screaming, but occasionally. His hard childhood didn't bring him down. On the contrary, he let music lead him, he let it be his life. Taking a look at him now, we may say, he chose the right thing. 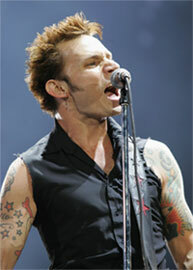 Michael Ryan Pritchard, or Mike Dirnt as he is known to his fans, was born on May 4th, 1972. From the start Mike didn't have the greatest childhood, and was put up for adoption because of his birth mother's heroin addiction. The foster home he was placed in decided they couldn't bear to part with him, and later adopted him. When Mike was seven, his parents separated and Mike and his sister moved to Rodeo, California, where he would meet his best friend and lifetime musical partner, Billie Joe. The two met up in the school cafeteria, and hit it off extremely well, seeing as how they both had a massive interest in music. Pretty soon they began jamming together at Billie's house and the music of all the wicked eighties rock bands like Kiss and AC/DC began to warp their lives. After an endless amount of covers, Mike picked up bass and they decided they had to form a band, which they would eventually call Sweet Children. Just when things seemed to be perking up, Mike's mom hit him with some bad news. Life in California, particularly The Bay, was expensive, and being a single mother she couldn't afford it. Mike said that he couldn't leave, and she understood. Even though his mother was gone, Mike moved into Billie Joe's house, where his Mom knew he would have a safe home with Billie's family, with his siblings and his mother Ollie. Now that he was able to stay in The Bay, music could become their whole life. The very first day after Mike graduated, Sweet Children went on their first tour. Things were going amazingly well for the band and Mike was becoming the best bass player in the history of forever, but they were about to hit a bump. John, their drummer was leaving the band, but this only left room for Tré Cool to hop aboard. When Dookie blew up and became an enormous success, Green Day was in high demand. One place they were wanted was Woodstock 94. Woodstock was a rock festival packed with chaos and craziness. So crazy in fact, that a gigantic mud fight had erupted and resulted in Mike being tackled and having to get emergency dental surgery. In fact, Mike has been through a lot of mishaps and accidents during his career. After the release of Insomniac, Mike married his long time girlfriend, Anastasia. The two had a child together in April of 1997, named Estelle-Desiree. Mike and Anastasia's relationship began to crumble and despite their best efforts, they couldn't fix it, which resulted in them getting a divorce. After his marriage to Anastasia, he married again in 2004 to a girl named Sarah, but due to all the time in the studio, they couldn't remain together. He is currently dating a girl named Brittney Cade who can often be seen attending award shows and supporting Mike. To show just how much he loves Brittney, Mike has her name tattooed on his arm. Brittney's name isn't the only tattoo Mike has either; he has plenty. Mike and Brittney had their first child together, Brixton Michael, on October 11, 2008. He weighed eight pounds. Over the years, Mike has become an extraordinary bass player, and such an excellent bass player needs equally good equipment. Aside from Green Day, Mike is involved in quite a few little side projects. He has his own Café, a band called The Frustrators which has released 2 EP's, and his own signature bass. Mike is a rock idol to all kinds of bands and has inspired so many people to pick up an instrument and just have fun. From 1,039 Smoothed Out Slappy Hours to American Idiot, he plays an important role in Green Day and is part of the glue that keeps the band playing together.